What does it mean to be a Christian in these times? The works of mercy knock on our door. The hungry, the naked, the sick, and the prisoner demand our compassion -- but more, they demand our action. I am thinking of the prisoners especially as I prepare for trial in Washington, D.C., tomorrow. There are the 2 million men and women who crowd U.S. prisons -- many for nonviolent offenses. Then there are the tens of thousands shoved in the dark corners of the U.S.'s vast but hidden archipelago of "war on terror" detention. Guantanamo -- perched on the tip of Cuba -- is the most visible and the most vulnerable. Since walking from Santiago de Cuba to Guantanamo as a work of mercy -- to visit the prisoners and appeal to the humanity of their imprisoners -- with friends in 2005, I have been particularly concerned with what has been called the "gulag of our time." And so tomorrow, 35 of us go to trial for an action at the U.S. Supreme Court. On Jan. 11, a day that marked six years of torture and abuse at the U.S. Naval Base, 80 of us were arrested there. In the statement we read there, we explained that "We are here to bring their plight and the plight of all prisoners from this current war, to the 'highest court in the land.' We are here to make their suffering visible, to make their voices heard, to make their humanity felt." And we continued that after we were arrested -- many of us were taken into custody under the name of a Guantanamo prisoner. And in a new twist on traditional protest, we will continue to carry those names into the courtroom on Tuesday. 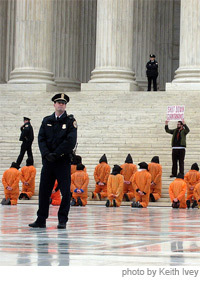 This act symbolically grants the Guantanamo prisoners their day in court, which the Pentagon has denied them for years. For example, Christine Gaunt, a grandmother and third-generation hog farmer from Grinnell, Iowa, will carry with her into the courtroom the name and the memory of Abdul Razzaq, an Afghani man sent to Guantanamo in 2003. She reflects: "Abdul Razzaq continually claimed his innocence. He died in Guantanamo in 2007 of cancer, leaving behind children and grandchildren. He never had a chance to make his case in a court. I will take his name to honor his right to justice before a proper court, a right cruelly denied him at Guantanamo."